Today is the 13th yahrzeit of the seventh Rebbe of Lubavitch, Rebbe Menachem Mendel ben R. Levi Yitzchak Schneerson, ztvk"l. No one can deny that his impact on Jews throughout the world, since he assumed the mantle of leadership of the Chabad-Lubavitch Chassidic movement in 1950, was (and still is) tremendous. In 1950, Rabbi Yosef Yitzchak passed away. Although Rabbi Menachem Mendel was the obvious successor, he was initially reluctant to accept the mantle of leadership. A year later, he formally assumed the title of Rebbe, explaining to members of the movement that while he would be devoted to his work as leader, each man and women was ultimately responsible for his or her own actions, and for his or her pursuit of G-dliness. The ensuing forty-four years of the Rebbe's leadership saw Lubavitch grow from a small movement nearly devastated by the Holocaust to a worldwide community of 200,000 members. 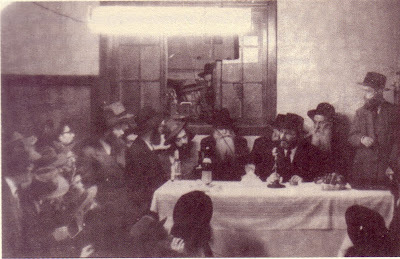 The Rebbe, recognizing the unique needs of the current generation and anticipating the societal needs of the coming decades, began to establish education and outreach centers, offering social-service programs and humanitarian aid to all people, regardless of religious affiliation or background. He established a corps of Lubavitch emissaries (shluchim) and sent them out to build Chabad-Lubavitch centers worldwide, to serve the spiritual and material needs of the local communities. Today there are more than fourteen hundred Chabad-Lubavitch institutions in thirty-five countries on six continents. Indeed, many, many Jews, even if not counted amongst Chabad Chassidim, had their first encounters with Torah-true Judaism as a resulted of the Rebbe and his innumerable shluchim, emissaries. This includes yours truly, who was “reintroduced” to Judaism by Meir [Michel] Abehsera in Binghamton, New York [a long story, not for now]. Meir himself had just “returned” to his Jewish roots - through the Lubavitcher Rebbe - at about the same time, the early 1970s. Here is a story of one of Meir’s personal encounters with the Rebbe zt”l during that era, A Rehearsal for Redemption. Mystical Paths - Akiva’s personal encounter, The Rebbe - Face to Face. Finally, Reb Shlomo Carlebach was one of the first shluchim of Chabad. No, you don’t have to believe me, here are Reb Shlomo’s own words, and those of his close talmidim, to prove it! Everybody knows that the Lubavitch has thousands of shlichim (emissaries), everywhere in the world, whose only mission is to return Jewish souls back to Hashem. But everybody might not know that back when the last Lubavitcher Rebbe just began his humble career as Rebbe, he had but one shliach. This was Reb Shlomo. Back then, there was no such thing as kiruv (outreach). While the Baal Shem and his disciples had connected with many a lost soul and spread the teachings of Chassidus among the faithful, there was no organization among the Chassidim, or in the entire Jewish nation, dedicated to returning these souls to the roots. The seventh Rebbe set out to change the situation. Reb Shlomo was the Rebbe's first "partner". Reb Shlomo talks of the seventh Rebbe taking "secular" Jews under his tallis during prayer, transforming these neshamos back into G-d consciousness. Reb Shlomo talked of how sick people came to the Rebbe asking for healing. The Rebbe would ask them to swear to put on tefillin daily. Reb Shlomo talked of seeing miraculous healing taking place. The seventh Rebbe of Lubavitch ordered his new partner, Reb Shlomo, to travel the streets, the subway, to talk to people. I learned in Lakewood for a while. Then one day, the Rebbe told me that the world needs me to talk to Jews. The Rebbe mamash gave me a new soul. Everyone I saw, I wanted to grab and say, "Gevald! Don't you know there is a Rebbe in the world?" I decided that whenever I should go out on the subway, I not leave until I found a Jew and taught him some Torah. Once, it was the night before Shavuos (the Feast of Receiving Torah), a Wednesday night. I just had the privilege of having Yechidus (a private audience) with the Rebbe -- it was heaven. I left the Rebbe at about four in the morning and got into the subway. Opposite me sat a young man who appeared to be Jewish, but I wasn't sure. He seemed very happy. I said, "My friend, why do you seem so happy?" He explained that although he was Jewish, he was planning on getting married that Shabbos (which would be the second day of Shavuos) to a non-Jewish girl in a church in The Bronx. "So you see", he beamed, "this is going to be a very special weekend for me." I knew it would be a very special weekend for him, but not for the reason he thought. I told him that getting married is great, but before he goes to the Chupa in the church, he should get a blessing from a very holy man. I explained to him that it just so happens that this holy man lives only a few stations behind us. By then it was 4:30 AM. I knocked on the Rebbe's door, and he opened it. My friends, many people have had the privilege of having Yechidus with the Rebbe, but how many have had the privilege that the Rebbe should open the door for him? I had my arms around this boy and I explained to the Rebbe that this boy plans on marrying a non-Jewish girl in a church in The Bronx on Shabbos and Yom Tov. I mean, how far can you go? The Rebbe told me to wait outside and took this boy into his office. I waited outside the Rebbe's door until 7:30 saying Tehillim (Psalms). You know what the Rebbe was doing? He was washing this boy's soul out. There wasn't just a little dust on his soul. 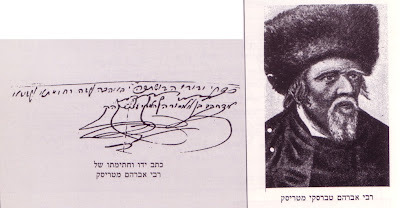 The Rebbe mamash had to do plastic surgery on his neshama. The Rebbe opened the door and the boy's eyes were red with tears. The Rebbe told me to take him to the mikva and then to put on tefillin with him. I don't have to tell you the rest of the story. He didn't go to the church in The Bronx to marry this non-Jewish girl. Instead, he spent Shavuos in "770" and had a very special weekend. The heartbreaking thing is that we know there was not a Rebbe like this ever before and that there will never be a Rebbe like this again. Zechuso yagein Aleinu – May his numerous merits protect us all! The Rebbe’s yahrzeit, at Ynet News [Yediot Acharanot's English website]. A Simple Jew informs us that the Sudilkov [Rebbe] was in Lubavitch [Ohel] on Gimmel Tammuz. 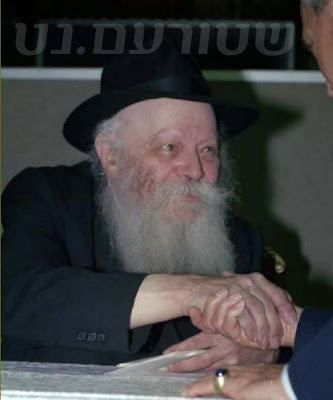 And Akiva of Mystical Paths has some great pics of the former Rishon L'Tzion (Sephardic Chief Rabbi of Israel), HaRav HaGaon Mordechai Eliyahu, Shlita, by the kever of the Lubavitcher Rebbe on Gimmel Tammuz, with a link for more! Today is 2 Tammuz, and the 118th yahrzeit of Rebbe Avraham of Trisk, one of the eight sons of Rebbe Mordechai of Chernobyl, all of whom became Chassidic Rebbes. The following story is from Rav Zevin’s Sippurei Chassidim [A Treasury of Chassidic Tales], and is also found in The Holy Beggars’ Banquet on page 191. Intro: The Chassidic Tish, where the Rebbe shares his meal with his Chassidim and virtually anyone else that wishes to participate, has been a Chassidic custom since its inception. Many reasons are given for this seemingly strange practice. Below you will find yet one more aspect. Rebbe Avraham, the Maggid of Trisk, at his own expense, would personally house and feed any person who came to him. People come to Trisk by the hundreds and by the thousands; among them were people of means, Torah scholars, famous rabbis, pious people, and the like. All, regardless of rank, were expected to eat at the Rebbe's table. Weekday, Shabbos, festival, it made no difference. The Rebbe listened in silence and said nothing. The Chassidim took the Rebbe's silence to mean that he agreed with their suggestion. And so Rebbe Avraham of Trisk continued to feed all the Chassidim who came to him. The following story is found on several websites, including Ascent and Hasidic Stories, but its source is the book “Shlomo’s Stories” by Shlomo Carlebach with Susan Yael MeSinai. Most people are so out of touch with life in this world that they think it's crazy to speak of life on the Other Side. But it isn't. There's life in this world and the next. According to Jewish tradition, while Heaven is more pure, life in this world is the central focus. Men come here to be fixed and made whole. Word has it that the tzaddikim run both worlds. Essentially, they run the whole show. The Heavenly Court is governed by tzaddikim who have died recently. They replace other righteous men, tzaddikim who've been in Heaven too long to remember the reality of struggle in this world. Once Rebbe Michel Zlotchever passed away, he was called to judge on the Heavenly Court. As soon as he took his place, he came down harshly on all those he had to review. "How could you do such wrong?" he yelled at them. Finally, one of the tzaddikim on earth realized what was happening and began to complain: "You can't appoint, as a judge, a man who has never sinned! What does the Zlotchever know of the hardships of Moishe the Water Carrier? He comes from a family that for thirteen generations made no mistakes." The worldly tzaddikim protested his severity so much that it was finally decreed that the Zlotchever would be retired and the tzaddik who had first complained should take his place. The decree went out just before Shabbos. The tzaddik on earth barely had enough time to say good-bye to his wife. Judging is done in heaven, but fixing takes place in this world, sometimes before the Judgment, sometimes after. We are speaking here of fixing the souls of those who have left this world. Judging will determine whether you go to Heaven or Hell, whether you are permitted to come back to life. But if the merchandise is damaged, it's not a question of Paradise or reincarnation. The vessels are broken. They need to be mended and made whole again. This kind of repair doesn't take place in Heaven. Nor can we do it ourselves. A soul who needs fixing has to come back into the world and look for a tzaddik to help him. Naturally, if he was close to one while he was alive he will have no problem, because his soul is still attached to that tzaddik. But what happens to a person who was never attached to a tzaddik during his lifetime? Everybody knows that the Trisker Maggid, Reb Avromoleh, was one of the eight sons of Rebbe Motteleh of Chernobyl who was mamash a tzaddik gadol. Reb Motteleh was the center of all the tzaddikim. He took care of the living and the dead and was the master of the lamed-vav tzaddikim, the Thirty-Six Righteous Men who hold up the world. Before he passed away, Reb Motteleh divided his kingdom among his children and put the Trisker Maggid in charge of the people from the Other Side. Reb Avromoleh lived like this. At eight o'clock in the morning he'd get up, go to the mikveh and pray. At two o'clock in the afternoon, he would start to yawn. "I'm so tired, I've got to lie down a little bit." He'd go to his room until three, then pray both afternoon and evening prayers. At ten o'clock at night he might start yawning again. "I'm so tired. I've got to go back to my room." The fact of the matter is that the Trisker Maggid never ate and never slept. He also never kept any books in his room, because - as everybody knows - when he closed the door to his room he was dealing with souls from the Other World who needed fixing. People from the Other Side are not able to read Torah. In order to avoid making them feel bad, the Trisker Maggid never permitted books in his room. If he found one, he put it out. The Trisker Maggid once came to a village where only one Yiddeleh [Jew] had enough room in his house to accommodate the Rebbe and his Chassidim. But this man was a real Misnagid [an opponent of Chassidus]. He had heard many stories from his fellow Misnagdim and was suspicious of the rumor that the Trisker Maggid never slept and never ate. "Eating I can believe. He sleeps so much, he doesn't need to eat. But he doesn't even keep a book in his room, so you can't tell me he isn't up there napping!" This wealthy Yiddeleh was more than happy to have the Trisker Maggid as his guest, because it would give him a chance to prove what Reb Avromoleh was doing behind closed doors. "He's snoring, I'm sure." While the Trisker Maggid was davening Ma'ariv, the evening prayer, the Yiddeleh managed to get into Reb Avromoleh's room and to hide under the bed. At ten o'clock, the Trisker Maggid said to his Chassidim, "I have to go back to my room." The rich Yiddeleh heard Reb Avromoleh come into the chamber and felt him sit down on the bed. No sooner had the Chassidim closed the door to give the Rebbe a little privacy when it seemed to open again. A crowd pushed their way into the room. The man could hear the shuffle of feet, the murmuring appeals. During the day, the host had already witnessed the Trisker Maggid's audiences with ten, maybe even thirty people, at a time. But this sounded like thousands. What was happening? Where were all these people coming from? How could there even be a place for them in this little bedroom? During the day, people would complain: "Rabbi! I'm sick. Please cure my back." "I need money for my business." "Would you find a wife for my son?" But by night, the people were saying, "Rebbe! I'm so broken! They won't let me into Paradise. They won't let me into Hell. All I can do is wander. Rebbe, please fix my soul." The worst was that the Misnagid heard so many voices in the room. But when he peeked out from underneath the bed, he couldn't see any feet. The Yiddeleh was so frightened that he was shaking and had to do his best to keep his teeth from chattering. Suddenly, he heard another, different voice cry out: "Rebbe! Have compassion on my tormented neshama [soul]. Fix me! Fix my soul!" "What can I do for you?" the Trisker Maggid asked. "While you were alive, you never bothered to come to me. You didn't even give me one kopeck for tzedaka, one penny for charity, to connect yourself to me. So how can I help you now?" "There must be a way!" The poor soul pleaded with the Rebbe, from a place of deep anguish. "Actually, there is one way. Your neighbor, Shmuelik, was one of my top Chassidim. Shmuelik gave me a great deal of charity during his lifetime. If he were to tell me now that one penny of the riches he gave as tzedaka was for you, then I could find a way to help you." "Shmuelik would do that for me, I'm sure." "Fine! Then I want you to go and ask him!" "How can I do that? He won't believe that I come from you." "Then I'll send somebody along to act as your witness." At this point, the Trisker Maggid gave a strong, swift kick under the bed and said to the Yiddeleh: "Come out!" 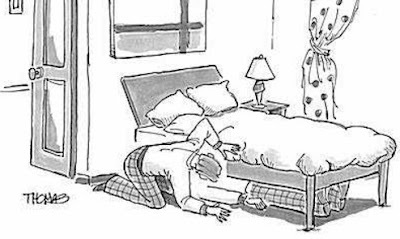 When the Yiddeleh realized that the Trisker Maggid was about to send him into the Other World as witness to an exchange between two souls, he began pleading from under the bed. "Please, Rebbe! Don't do this to me! I promise I won't tell anybody what I saw!" The Yiddeleh came out, crawling on his stomach. 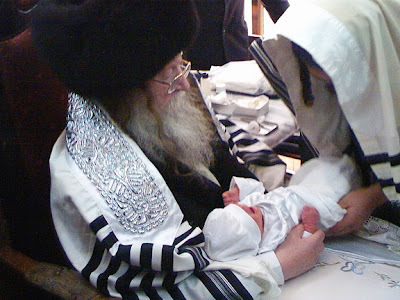 He was crying, screaming, clinging to the Rebbe's feet. "Please, Rebbe! You've seen! I have a wife and three children. I don't want to die yet. I'm not ready to die!" "G-d forbid you should die. But if you're going to spy on me, you must go as my witness. Take my stick and walk with the soul of this man to the cemetery." The Yiddeleh looked around. The greatest nightmare of all was that there was absolutely no one else in the room, only himself and the Trisker Maggid. "Knock on the first grave in the second row and say that Avraham ben Chana orders Shmuel ben Rivka to give one penny to fix the neshama of this Yiddeleh - Yosseleh, his neighbor." Reb Shlomo concluded the story by saying: The beautiful aspect of this story is that I actually heard it from the great-great-grandson of the man who hid under the bed. It goes without saying that he lived to become a very great Trisker Chassid. And Yrachmiel of Ascent added: [This was] confirmed by the general manager of Ascent, who is the great-great-grandson of the Trisker Maggid. Zechuso yagein aleinu v’al kol Yisrael – May the Trisker Maggid’s merits protect us all! I listened to another mp3 program from wnyc.org's program, Radio Lab, on the topic of memory. I have three reflections on the mechanics of memory from that very informative program after listening to the fascinating story of Clive, a musician and conductor who was struck with a disease that took away his ability to remember anything more than 7 seconds in the past. It's an unbelievable story of someone with no past and no memories. All he has is the present. ...One of the only two things this man with Amnesia did remember was music and his love for music. When people speak to him normally, he knows nothing about music, his life as a conductor, or anything related. However, when they placed his former students in front of him and gave him a conductor's baton, he immediately began reading the music, conducting and leading his students as proficiently as if nothing had every happened. When the piece was over, however, he didn't even remember what had happened. It was exactly as before. What was so deep about music that is is virtually the only thing this man can remember when he can remember nothing else? In Rav Moshe Weinberger's shiur, "The Power of Music - Tazria-Metzorah," he explains the deep place in the soul that music is connected to. It's unbelieveable but somehow, the soul is deeply connected to music, such that hearing a certain song can evoke feelings from decades ago that had long since been dormant. It can stand out in a person with no memory of anything. It's an amazing koach [power], and it was very interesting to hear of this amnesia case, where music was about his only connection to his former self. It is also a mussar haskeil [ethical lesson] that we have to take very seriously the types of music we listen to and the source of the music we listen to, since it has a very deep connection to who we are. Music works wonders on a person's memory; it opens previously lost worlds. And be sure to read the entire piece, here. Today is the yahrzeit of Rebbe Nachman of Horendenka. 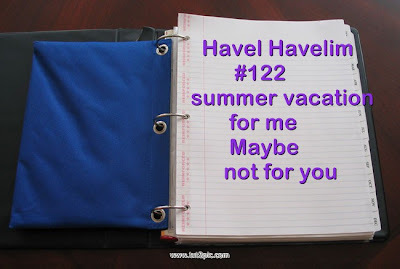 Be sure to check out this great piece by A Talmid, at the Zechus Avos blog. Akiva of Mystical Paths reminds us that tonight and tomorrow is Gimmel Tammuz, the yahrzeit of the Lubavitcher Rebbe ZT"L, and that one should take on an activity which increases Jewish unity. Dixie Yid has just completed a translation of R. Yitzchak Meyer Morgenstern's Kuntress on the practical manifestations of Chochma and Bina within the Jewish people (i.e. Ashkenazim-Sephardim, Chassidus-GR"A, Breslov-Chabad). The introductory post can be found here, and each post links to the next. You might also find the specific posts on Chabad and Breslov, and Chassidus and GR"A particularly interesting. Enjoy and please leave comments with any feedback. Mystical Paths has some interesting posts, inspired in part by A Simple Jew, on “The Animal Within.” Here’s Part One and Part Two. A Simple Jew himself has a fascinating post on “A Half-Hourly Chime,” which I hope to complement here by Tisha B’Av [see my comment there]. Rabbi Tal Moshe Zwecker [another Simple Jew connection] has just started his own blog, Be'er Mayim Chaim: Wellsprings of Chassidus & Jewish Meditation, which features the Baal Shem Tov's teachings, Classical Chassidus, Noam Elimelech, Kedushas Levi, Degel Machaneh Efraim, Meor Einayim, the Rebbe Reb Zusha of Anipoli and many more. Also, you can obtain Jewish Chassidic and Kabbalah Meditation classes on MP3 recordings. ShofarNews has an article (Hebrew) on the almost-completed Kinor (harp/lyre) for the Levi'im to play when the Third Beis HaMikdash will be rebuilt בב"א. The Temple Institute (Machon HaMikdash) is behind the project, as usual. Here's a link to pictures of the in-progress development of the Kinor. Scores of Chassidim and Jews who appreciate all that is Modzitz gathered at the Rebbe Shlita's Beis Medrash in Bnei Brak for the Shabbos preceding the first yahrzeit of the previous Rebbe, the "Nachalas Dan", zecher tzaddik v'kadosh livracha. They came from all over Israel...as well as visitors from Boro Park, New York, to be with the Rebbe Shlita as we near the end of a year of mourning for the passing of the Nachalas Dan. And this took place in the very same Beis Medrash that became the Rebbe Zt"l's home just over 12 years ago, after 60 years in Tel-Aviv. The walls of this Beis Medrash, for eleven of those years, heard his Tefillos, Divrei Torah, and of course, his powerful Niggunim -- and they have reverberated in our hearts and minds ever since. Kabbalas Shabbos on Friday night was led by HaRav Yitzchak Lipa Fishbein, who treated us to two of the most well-known niggunim of the Nachalas Dan. The Beis Medrash was absolutely packed, with tens of people forced to daven outside, as there simply wasn't room for anyone else to even squeeze in. As the final verse of Lecha Dodi, "Bo'i B'Shalom" was sung, the niggun was repeated several times, I closed my eyes and visualized the following: the Nachalas Dan, from above, was lifting each one of his Chassidim over a hurdle. For indeed, the power of his Tefillos, Divrei Torah and Niggunim did just that for all of us for some 22 years. HaRav Fishbein said afterwards that he simply ran out of energy midway through Kabbalas Shabbos, but somehow found a new reserve. He said he owed it to both the Nachalas Dan and to the tzibbur [congregants]. The yahrzeit Tish is tonight in Bnei Brak, following Ma'ariv at 8:30 pm, while tomorrow will be a day dedicated to Torah-learning in memory of the Rebbe Zt"l, followed by prayers at the gravesite on Har HaZeisim [Mount of Olives] and the Kosel [Western Wall]. There's an amazing story in last Friday's Hebrew HaModia about the Rebbe Zt"l, which (bli neder) if I have time, I'll translate & post here before Shabbos. Zechuso yagein Aleinu v'al Kol Yisrael, Amen!